When assessing the market, I find it helpful to treat strength and weakness as independent variables. In other words, we can have markets in which many stocks are strong and few weak; many weak and few strong; few strong and few weak; and many strong and many weak. The latter is possible when correlations among sectors and stocks are relatively low. Let's take the Parabolic SAR indicator system developed by Wilder. 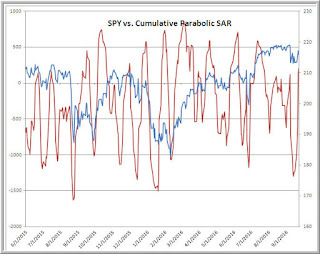 One way I track market strength and weakness is to take a cumulative running total of Parabolic SAR buy signals minus sell signals for all NYSE issues (red line, above). This has been helpful in capturing cyclical behavior in SPY (blue line). (Raw data from StockCharts.com). But we can also consider the buy signals from the system separately from the sell signals as proxies for market strength and weakness. For example, since mid-2014, when I first began collecting these data, when we divide the sample into quartiles, we find that, after a single day of many new buy signals (top quartile), the next 10 days in SPY have averaged a loss of -.23%. After a single day of few buy signals (bottom quartile), the next 10 days in SPY have averaged a gain of +.80%. When we've had very few sell signals (bottom quartile), the next 3 days in SPY have averaged a gain of +.26%, compared with a -.01% loss for the remainder of the sample. Over a next 10-day period, however, when we've had many sell signals (top quartile), the next 10 days in SPY have averaged a gain of +.52%, compared with an average gain of +.09% for the remainder of the sample. Overall, the percentage of variance in daily sell signals accounted for by buy signals is only about 10%. They indeed are more independent than one might expect. It is in the interplay of waxing/waning buying and selling that we can sensitively track cycle dynamics. Combined perspectives can have their use, as well. Suppose we look at the total number of buy *and* sell signals each day. Interestingly, when we have many buys and sells (top quartile), the next 10 days in SPY have averaged a gain of +.33%. 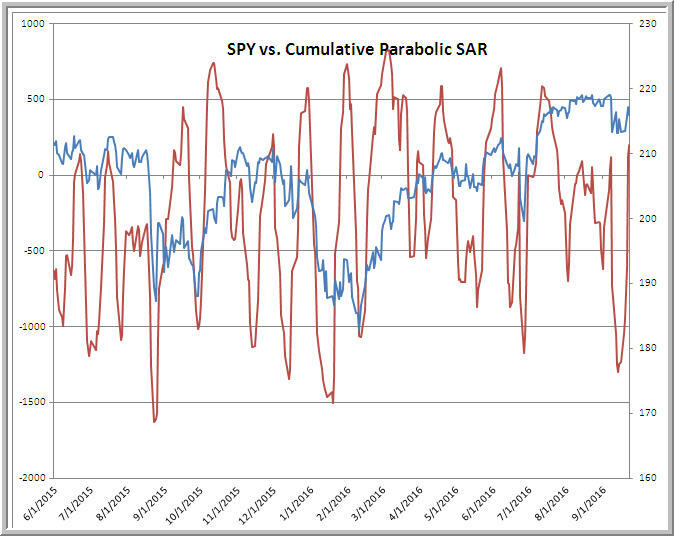 When we've had very few buys and sells (bottom quartile), the next 10 days in SPY have averaged a gain of +.59%. All middle occasions have averaged a loss of -.06%. Think about how momentum and value operate, and then think what it means to have many versus few trading signals. Think about cycle structure and when you'd expect to have many and few trading signals. We can learn a lot once we tease apart strength and weakness and view markets multidimensionally.